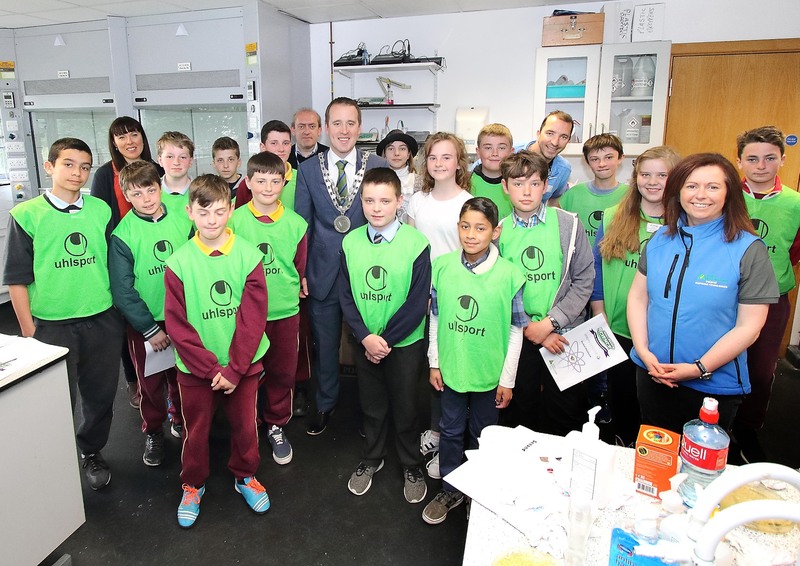 Mayor of Waterford City & County Council, Cllr.John Cummins pictured with students from St.Declan NS, Mount Sion NS and Waterford Educate Together in the labs of Waterford IT during last week’s Challenge Science event. A programme that has seen 1,700 primary school pupils from across Waterford and south Kilkenny attend science workshops at Waterford Institute of Technology (WIT) since 2006 has marked 10 years of inspiring future scientists. Organised by Junior Achievement Ireland (JAI), the annual Challenge Science event this year saw 150 children get hands-on in the labs at WIT as they conducted exciting experiments under the watchful eye of WIT, JAI and Genzyme personnel. As part of a special two-day programme designed with their age group in mind, the Challenge Science pupils aged 11-12 from St Paul’s Boys’ National School; the Presentation Primary School; St Senan’s National School; Mount Sion Boys’ National School; St Declan’s Boys’ National School and Waterford Educate Together learned about forensic science, famous scientists and biopharmaceuticals. They were also given tips for future study and career paths as they look ahead to secondary school. Challenge Science was developed to introduce primary school pupils to a world of discovery and to make them more aware of exciting study and career opportunities in Ireland’s thriving science, engineering and technology sectors. In Waterford, the programme is delivered at WIT in partnership with Genzyme. This year, 17 volunteers from the biopharmaceutical company’s Waterford campus led workshops over the two days. They took the number of volunteers from Genzyme to over 120 since the programme began 10 years ago. To mark the 10-year anniversary, Genzyme hosted a celebration of the event, attended by Cllr John Cummins, Mayor of Waterford City & County along with some of the staff who had volunteered since 2006. In addition, some of the first young people to participate as primary schoolchildren and who are now pursuing science at third-level or – in one case – working at Genzyme, shared with the audience how their career paths have advanced towards science since attending the first Challenge Science in 2006.